So how do the Dodgers—the team with the best run differential in the National League, and the third lowest total of runs allowed in baseball—find themselves in third place in the NL West, and fifth in the NL Wild Card? Well, for starters, by performing pretty poorly in one-run games, where they’ve amassed a disheartening 14-21 record this season. The numbers have somehow gotten screwier since the All Star break, when the Dodgers picked up Manny Machado and were the toast of baseball. Since then, they’ve outscored their opponents by a combined 20 runs and have a crappy 13–15 record to show for it. There’s plenty of noise in there—a 21–5 win over the Brewers on August 2, for example—but the numbers line up pretty neatly with the good old eye test: The Dodgers are too talented to have just the eighth best record in the crummy National League. And time is becoming a factor. All of which made what happened Saturday night, against the Mariners, especially painful. Rich Hill survived a four-run first inning to give the Dodgers six solid innings, but their offense was held to just three hits over five innings by Mariners starter Erasmo Ramirez. It was the eighth inning before the Dodgers struck again, with a pair of solo dingers by Justin Turner and Cody Bellinger, and a dramatic ninth-inning solo shot from rags-to-riches Home Run Derby hero Max Muncy tied the game. A stirring late-innings comeback! Extras! “That was a tough one. It’s (a balk) obviously when you’re trying to deceive the runner. Obviously, there was no intent to deceive. I thought he stepped off in time, but I looked back at the replay and there was a little bit of a buckle of the knee,” Roberts said. 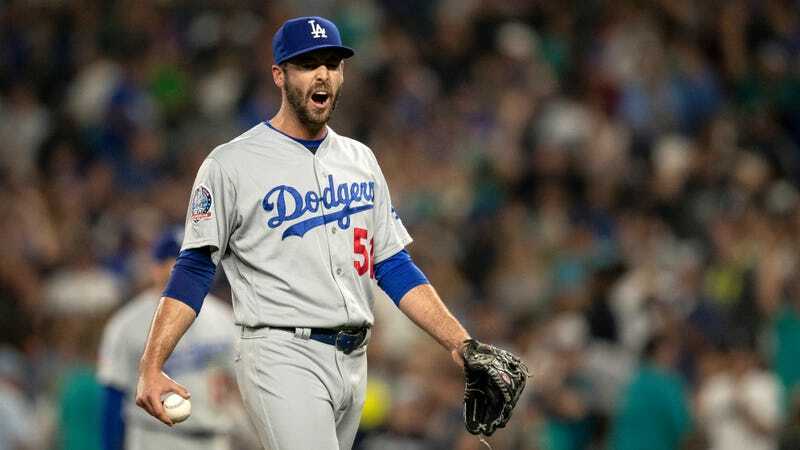 Floro dropped his hands before backing off the rubber and then watched in dismay as the balk sent the Dodgers to another difficult defeat. Floro was tagged with a walk-off walk last week in Colorado. Anytime Nelson Cruz sees something awkward from a pitcher in his delivery, his default is to start screaming that it’s a balk, even if it’s not. Baseball’s definition of a balk says a balk will be called “when a pitcher who is on the rubber makes any motion naturally associated with his pitching delivery and does not actually deliver the ball,” but it also makes clear, as Roberts points out, that the rule exists “to prevent a pitcher from deceiving the baserunners.” Umpires can’t know intent, and though a pickoff move with the bases loaded isn’t the likeliest thing in the world, they also can’t realistically infer intent from a situation. Floro did something different, even if you need either an electron microscope or one screaming Nelson Cruz to spot it. The Dodgers have now lost seven of ten games. The Mariners, meanwhile, present a hilarious contrast, sitting 18 games above .500 and 3.5 out of the AL Wild Card despite an upside down run differential, in large part because of their performance in extra-innings, where they’re 12-1; and in one-run games, where they’re now 31-16. I guess it’s better to be ... whatever it was that happened here, than good.